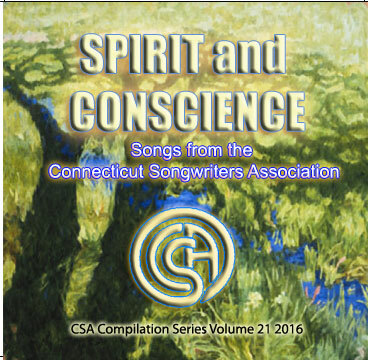 The Connecticut Songwriters Association is one of the oldest and largest songwriter groups in the U.S.. We are an educational non-profit organization dedicated to improving the art and craft of original music, combining arts, education and community outreach since 1979. More than 2,000 songwriters, musicians and vocalists from 28 states and 5 countries have joined CSA since it was founded in 1979. We have grown to become one of the most active and best known songwriters associations in the US. CSA sponsors monthly programs, with nationally known guest speakers, song critique sessions, and interactive workshops. 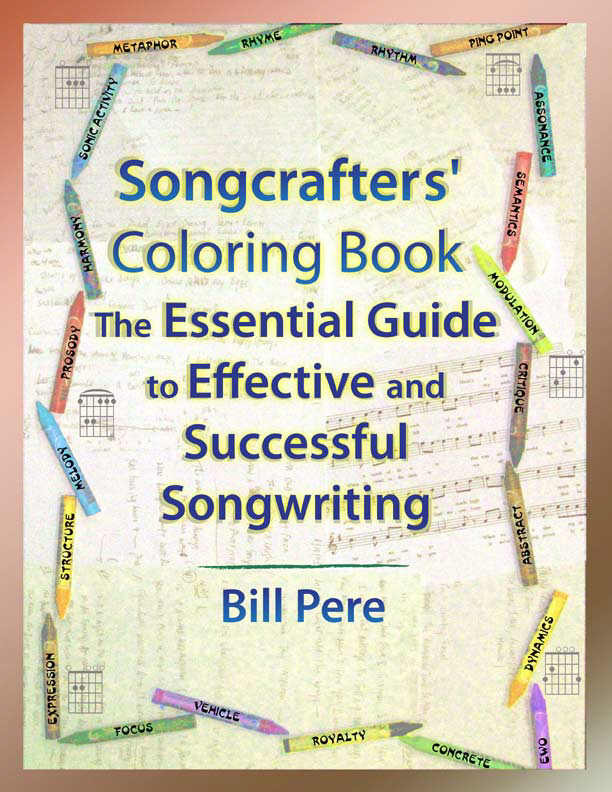 Monthly meetings and Critiques are hosted by President and Grammy Winning songwriter Bill Pere, named one of the "Top 50 Groundbreakers and Guiding Lights of the Music Industry" by Music Connection Magazine. Programs are designed to provide Indie Artists and mainstream writers with all the information, resources, and connections they need to be successful. We rotate meeting locations around the State, including: Glastonbury, Middletown, Mystic, etc. 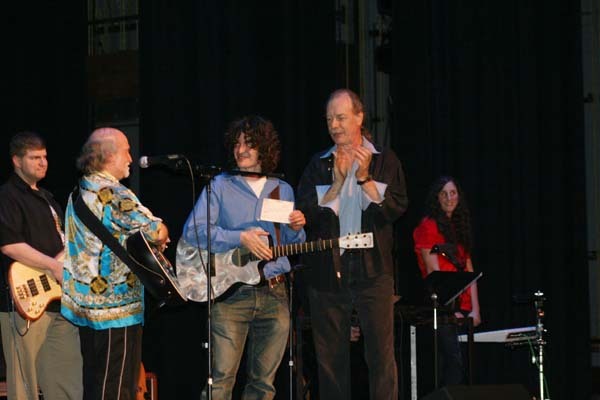 The Association produces songwriter showcases, benefit concerts, and a series of compilation recordings. 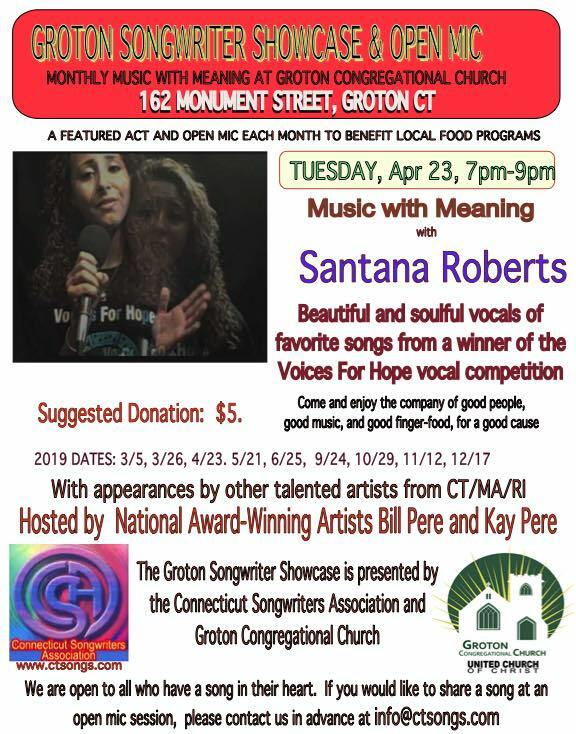 Our newsletter, Connecticut Songsmith, has been published monthly since 1980. As well as songwriters, our members consist of lyricists, composers, vocalists, producers, musicians, publishers, & recording artists. We actively encourage and facilitate collaboration. SUCCESS COMES FROM OPPORTUNITY, AND OPPORTUNITY COMES FROM INVOLVEMENT. BE INVOLVED! are always welcome guests at CSA meetings. You set your goals, and we'll help you achieve songwriting that gets results you set for yourself. Production, performance and promotion techniques to keep you moving forward. Business knowledge to help you get the most from your creations. 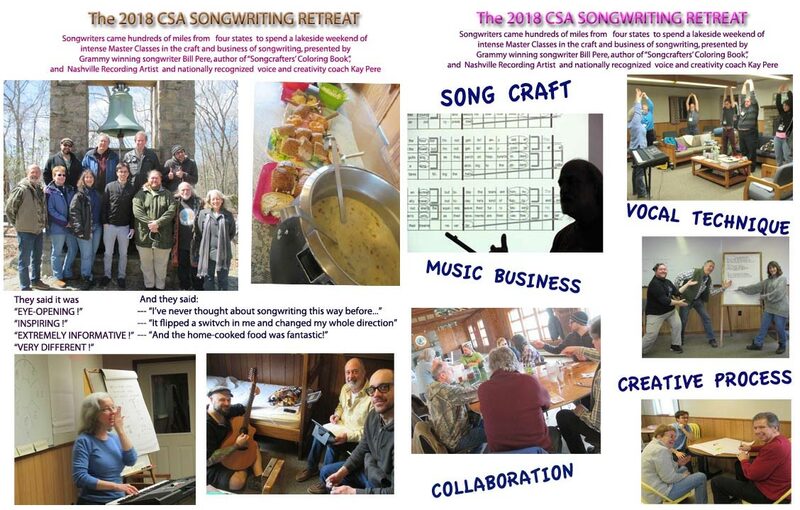 CSA ANNUAL SONGWRITING RETREAT APRIL 17-19, 2020! Get it on your Calendar Now! Transform Your Career! LIMITED TO 12 SLOTS! "Best Value in the Industry!" APRIL 17-19, Camp Wightman in North Stonington. Slots are filling -- dont' be left out -- Info here! FOR THE NEXT CSA COMPILATION CDs. HERE ARE COMPILATION CDs #21 & 22! !!!!! CSA ENVIRONMENTAL SONG CONTEST !!!! !!!! SEE THE FINAL RESULTS HERE !!! GET THE CD COMPILATION HERE!!! for a memorable performance. These benefit shows have raised thousands of dollars for charitable agencies. We are always open to helping folks produce events in any style of music. If you would like to be an event or showcase coordinator please contact us! It only happens if YOU make it happen ! 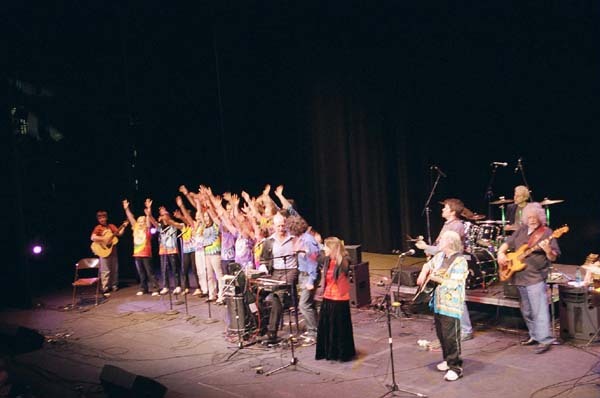 700 people were on their feet for this incredibly successful event to benefit Liberty Community Services for the homeless in New Haven, bringing together CSA artists, the Steve Chapin Band, and the LUNCH Ensemble. The CSA collaborative concerts presenting the music of the compilation CDs were great successes! using Good Search, you help us raise money for our community outreach through LUNCH. Please write my paper for me! I can't do it anyomre! "Life-Changing, Transformative, Inspiring, a shot in the arm!" The collected experience of 40 years of CSA! Your purchase helps support CSA Education Programs. industry pros at various Conference events. Are you a part of the CSA Community yet? CSA SHOWCASE Coordinator to start or run a performance showcase ? CSA Showcases, Special Events, Concerts. Would you like to perform at a show? 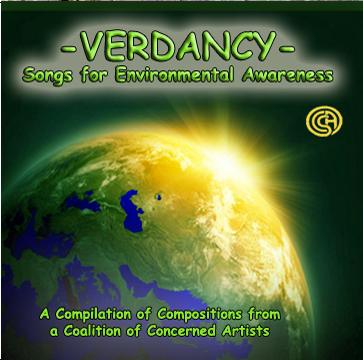 fits any of the themes, send it in for consideration for the next compilation CD. Songs should be well crafted and professionally produced. are distributed as physical CD's and sometimes as digital downloads. Writers get standard mechanical royalties from sales of digital downloads. You set your goals, and we'll help you achieve songwriting that gets results you set for yourself. Production, performance and promotion techniques to keep you moving forward. Business knowledge to help you get the most from your creations. Looking for a good place to hire essay writers?